For database administrators, import and export database is an important skill to have. Data dumps can be used for backup and restoration purposes, so you can recover older copies of database in case of an emergency disaster like situation, or you can use them to migrate data to a new server or development environment. This guide will show you how to export the database as well as import it from a dump file in MySQL and MariaDB. 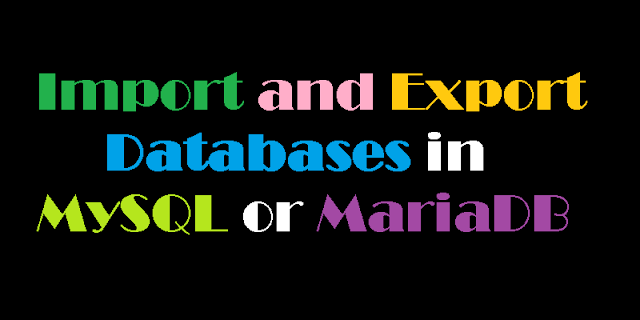 To begin with import and/or export a MySQL or MariaDB database, you will need access to the Linux server running MySQL or MariaDB and you should have the database name and user credentials to perform the steps mentioned in this article. The mysqldump console utility is commonly used to export databases to SQL text files. These files can easily be transferred and moved from server to server. You will need the database name itself as well as the username and password to an account with privileges allowing at least full read only access to the database. The top of the file should look similar to this, mentioning that it's a MySQL dump for a database named database_name. First, log in to the database as root or another user with sufficient privileges to create new databases. This will bring you into the MySQL shell prompt. Next, create a new database called new_database. You'll see this output confirming it was created. The successfully-run command will produce no output. If any errors occur during the process, mysql will print them to the terminal instead. You can check that the database was imported by logging in to the MySQL shell again and inspecting the data. This can be done by selecting the new database with USE new_database and then using SHOW TABLES; or a similar command to look at some of the data. We have demonstrated the steps of how to create database dumps from MySQL databases as well as how to import them again.